Growing up in Minsk, Gregory Podrez did not attend church as a young man—despite his parents’ urging. After completing military duty with the Soviet Army, however, something changed. Gregory found himself drawn to church services, and in time, he saw the truth and turned his life over to Jesus. Churches in Belarus were forbidden to baptize young people when he came to faith, so Gregory was secretly baptized. God gave him boldness in his faith, and in 1973, led him to teach youth Bible studies. He had to take care, however, to avoid government attention. In 1982, at the request of the Belarus Baptist Union, Gregory went to the city of Polotzk to begin missionary outreach. During his 12 years in this heavily atheistic city, Gregory formed a church of 70 members, and facilitated other groups of believers in the surrounding region. Eventually Gregory turned the work over to another pastor, and returned with his family to Minsk. 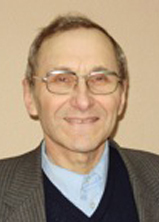 He attended the Baptist Bible Institute in Minsk, and since 1998, has worked closely with Gennady Brutzki. Like Gennady, he has a great love for the Jewish people, and a passionate desire to tell them about their Messiah. Pastor Podrez currently pastors our messianic congregation in Minsk, where he is responsible for many duties including: preaching, teaching, outreach, visitation, and humanitarian needs. Gregory and his wife Natalia have five children. We are grateful to have this dedicated brother as a part of our team in Belarus.